1. Plumbing. Residential plumbing typically uses 1½-inch pipes for drains. You’d be surprised how much gunk and hair goes down that drain. The larger the drain, the less likely it is to clog. The cost difference to upgrade to a 2-inch drain is practically negligible, and unless your framing doesn’t allow for it, you should consider increasing the drain in your shower to 2 inches. 2. Lighting. Consider recessed light fixtures throughout your ceiling to brighten up the room. Include one (or two) in your shower with the proper shower trim. Install a dimmer switch so you can adjust the mood in your bathroom. 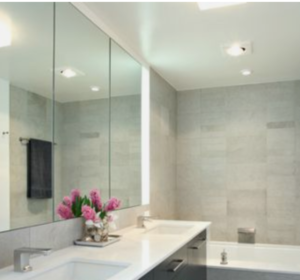 You’ll want to consider how you’ll be using the mirror in your bathroom and whether you want aesthetic or functional lighting. Whether you’ll be applying make-up or shaving, bright light fixtures properly placed go a long way to help you see what you’re doing close up. 3. Medicine cabinets. Do you have the space to recess your medicine cabinet? Oftentimes this is a great way to save a few inches of space over a shallow vanity, and the additional framing typically isn’t going to break the budget. 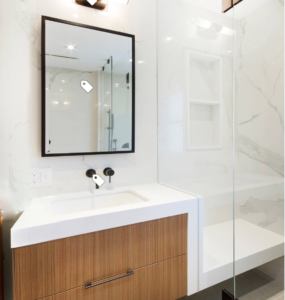 If that’s not an option, ensure that you have enough room at your vanity to have your medicine cabinet protrude by 4 to 5 inches. 4. Wall-hung toilets. These fixtures have grown in popularity lately, and for good reason. They no longer break the bank, and they also save space since the tank is hidden behind the wall. But there is a big consideration with these special fixtures. Because of how these toilets drain, if you ever change your mind and opt for a floor-mounted unit, you’ll have to rework the supply. 5. A window in the shower. This is a great feature if done properly. 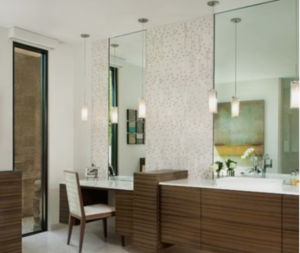 Some things to consider: Choose a frosted-glass panel for privacy and preferably one that opens for fresh air. Next, ensure that there are stone jambs along the entire installation so that this area is watertight. Also, ensure that the sill gets sloped down and away for proper drainage. 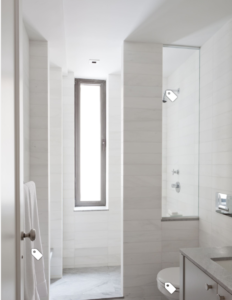 Lastly, I always specify a tilt-and-turn window in a shower, because the screen is located on the outside of the window; the handles are plastic, so they won’t rust; and the window provides full privacy even when tilted open. 7. Shower floors. Larger tiles are typically more difficult to slope properly, and unless they’re textured, they’ll be slipperier because the grout lines are further apart. 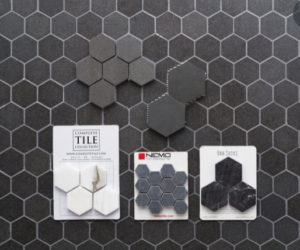 Smaller tiles, whether textured or not, offer more traction and are typically the norm for shower floors — though the options are nearly limitless. 8. Shower bases. Gone are the days of boring beige prefabricated shower bases. More and more, I’ve been using shower systems that have modern, clean bases made out of acrylic or porcelain. Don’t overlook other options for your shower floor. 9. Drawer storage. Consider installing a vanity with drawer storage rather than doors. Drawers are easier to access and easier to organize. They can be cut out around the plumbing and can be extra large to accommodate large items. 10. Shower or tub? When considering a bathtub or a shower-only option, ask yourself how many baths you take a year. I often have to remind my clients that they are not renovating their homes for a future buyer, but rather for themselves. Even if you live in your house only for another five years, it’s worth it to do it for yourself. And besides, there’s no guaranteed way to tell what will appeal to a future buyer.